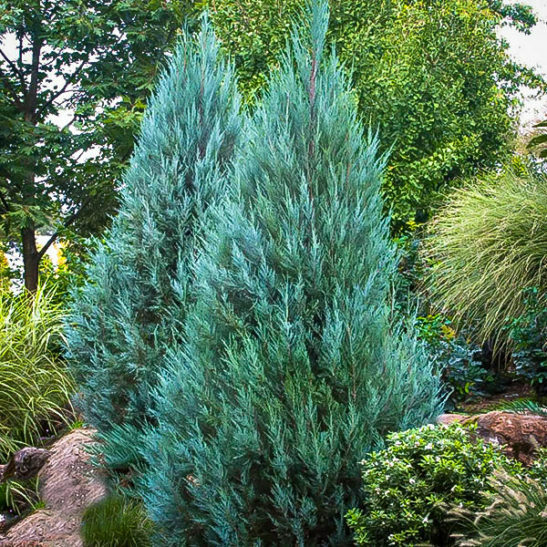 The Blue Point Juniper is an outstanding upright evergreen, with strongly-colored blue foliage. It grows steadily, adding at least 6 inches a year, so it will soon be a striking specimen on your lawn, or part of the varied planting around your home. In hot or cold areas this tree makes an effective screen, protecting your garden from the harsh elements, or from noise and urban pollution. It has an upright habit, reaching 8 to 12 feet tall in about 10 years. but remaining only 3 to 6 feet wide. Substantial and dramatic, this tree has a rugged natural beauty if left untrimmed, or it can be trimmed into formal conical shapes for elegance and drama. It is hardy down to minus 30 degrees, yet it also thrives in the hottest states, so wherever you live you can enjoy the beauty of this plant. 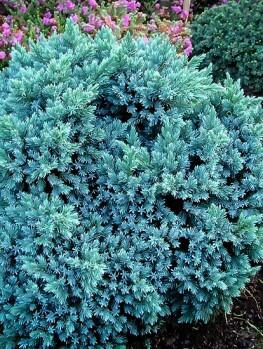 The Blue Point Juniper should be planted in a sunny place for the best growth and foliage color. It thrives in any soil that is well-drained, so plant it anywhere except in wet soils. Use a little fertilizer in spring to get the best growth, but otherwise it is free of pests, diseases or any problems. If you don’t trim, this really is a tree you can ‘plant and forget’, after the initial year, when it should be watered regularly to encourage it to establish quickly. For a powerful statement in your garden, without any fuss or bother, this is the plant you want. Every garden needs permanence – structural plants that are always there, without changing too much with the seasons. 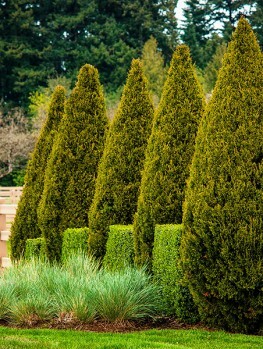 Evergreens, and especially conifers, provide that stability and allow us to make screens, specimens, foundation planting and backgrounds for other plants. These plants also have their own natural beauty, often through foliage color. Among these plants, Juniper trees stand out. 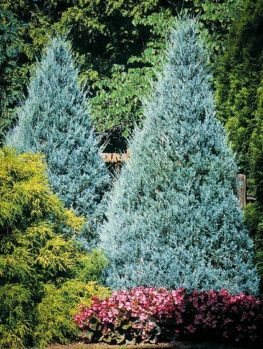 These tough, reliable evergreens thrive in cold or heat, in almost all soils, and look great all year round. They need no maintenance, unless you want to trim them for extra neatness, and most of all, they add interesting colors through their foliage. There are many different junipers, collected from around the world, both spreading and upright. 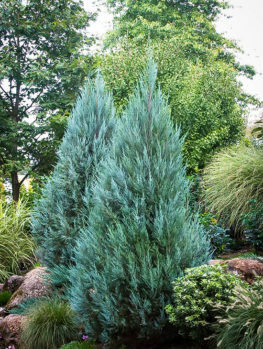 For a reliable upright form, with excellent blue foliage color and dense growth, look no further than the Blue Point Juniper. 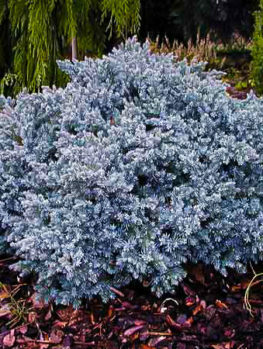 The Blue Point Juniper has proved its worth for the last 50 years, and it remains the number-one choice, with foliage of a striking silver-blue color all year round. It grows steadily, adding 6 to 12 inches each year, and reaching 10 to 12 feet in just 10 years. Like all conifers it will continue to grow for its whole life, so its ultimate size depends on age. When young it is narrow, and very upright, but over time it will become broader and more substantial, until its width is about two-thirds of its height. Of course, it can easily be trimmed from time to time to keep a narrower profile. 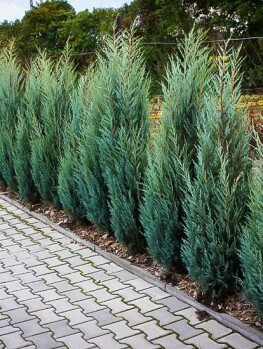 Plant the Blue Point Juniper in a sunny location, where its color and foliage density will develop best. We often plant deciduous trees on lawns, but evergreen plants like this make striking lawn specimens that don’t take up a lot of room, and the blue foliage color is even more dramatic against the lush green of a lawn. It is also excellent around your home, as part of the foundation planting, placed in a corner, or between windows. Don’t plant in front of a window, as its final height will obscure it, but beside a window or doorway it makes a great low-maintenance addition to the varied sizes and colors of plants around your home. Allow room for the final width when planting, and leave about 3 feet clearance for doors, from walls, or beside windows. Another effective use for the Blue Point Juniper is as a screen. Planted in a row, these tough trees will block cold winds and snow in the north just as well as block hot, drying winds in the south. Plant your trees 2 to 3 feet apart for a dense screen, or 4 to 5 feet apart for an avenue that will still reduce wind and give protection, even before the plants eventually join up. 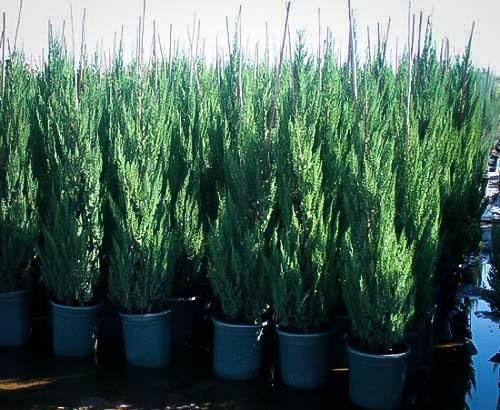 This reliable tree grows in any well-drained soil, and once established it is very drought resistant. In hotter states water occasionally through the hot months, but for reliability without needing attention, this plant is hard to beat. It has no significant pest or diseases. 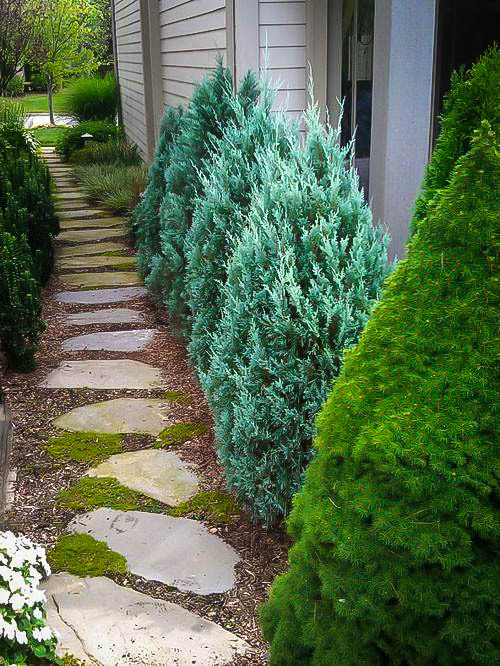 For stronger, more rapid growth, apply an evergreen fertilizer in spring. You can trim this plant at almost any time but avoid doing so during the hottest and coldest months. In cold areas, don’t trim in late fall, as new growth may be burned when winter soon arrives. Use sharp tools for trimming, to avoid ragged cuts, which can then brown, detracting from the beauty of your trees. The Blue Point Juniper is a selected form of the Chinese juniper (Juniperus chinensis) which grows naturally in China, Mongolia and Japan. In nature it forms a large tree to 60 feet tall, growing on hillsides and in rocky places. It has been grown in gardens in Western countries since its introduction in 1804, and many different forms have been developed. The leaves of this tree are of two types. On younger trees they are pointed, and these juvenile leaves give the plant a fuzzy texture. As the tree grows older, more adult leaves develop, which cling flat to the stems, creating smoother growth. The Blue Point Juniper is a selected form of this tree, that was found in the early 1970s at Monrovia Nursery in Visalia, California. 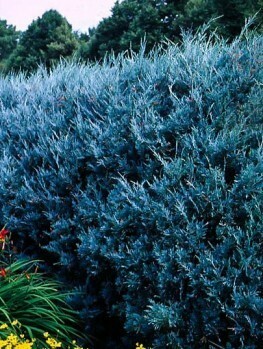 It was chosen for its outstanding blue foliage color, and its strong, upright habit. It has proved its value since then and remains a reliable choice for any garden. Our plants are grown from stem pieces taken from correctly named plants. They are not cheap seedling trees and they will grow as exact copies of the original parent plant. Seedling trees are inferior and very variable, and you cannot predict how they will develop, or what color their foliage will be. This well-known plant is a popular choice with out customers, so order now, while our limited stocks remain available.